It’s that time of year again where hospitals, clinics, and stores start advertising flu vaccines. As we transition into the winter flu season, no doubt you “health minded” groovyReaders would like to know the Flu Trends in your area. Google Flu Trends was launched November 2008 as a collaboration of searches related to “the flu” and the location and geographic area they originated. Over the past year they have upped the game, and Thursday morning 16 additional countries have been added to the flu tracking program which now covers a whopping 37 languages. Center for Disease Control (CDC) to ensure further accuracy. Interestingly Google realizes a 0.92 correlation with the official U.S. flu data. What we do not use in the models is a term like [swine flu] since people are more likely to type that into Google because they want to know more information about it, given the news headlines, and not because they actually have H1N1 or swine flu. 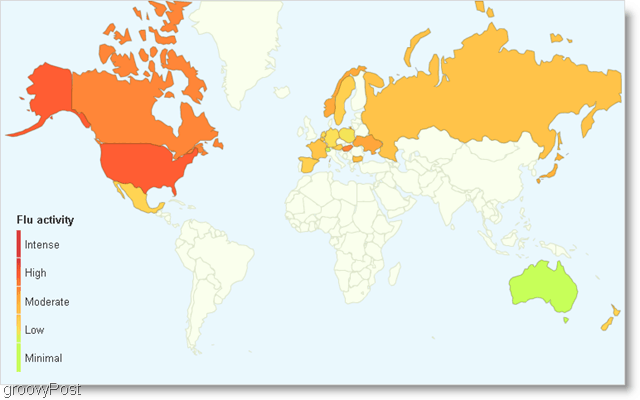 Once on the site, you can click on each Country or Region to get a detailed map of the region. From there you can drill in to get even more detailed Trending data. Looking at the trending for North America you can see the Flu season is starting early this year, spiking in September rather than in February. Swine flu? Panic? Or? Why Beneficial? 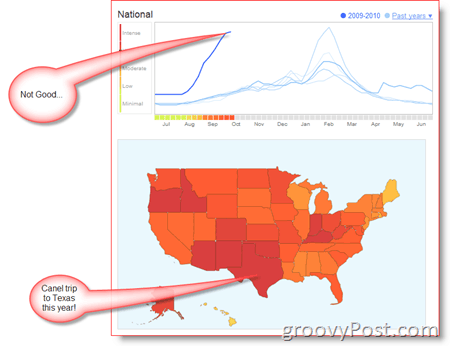 How can I use Google Trends? Government/Public Health agencies can use this data (I think…) to determine staffing levels and overall public heath. Retailers can use this data to determine how/when they should stock their shelves in various states/countries around the globe. Taking a vacation? You might want first to see how sick the population is. No fun going on vacation and getting sick while your’re there or bringing it home to your family and co-workers. Should I be worried that Google knows I’m Sick? Google indeed owns a wealth of data, and I appreciate their exposing such groovy data in such a positive way as Google Trends! Very cool site. Thanks for the tip. My spouse and i have been happy that Chris could complete his studies using the ideas he gained out of the site. It is now and again perplexing to just continually be freely giving things which usually people have been making money from. And we all fully grasp we have got the blog owner to be grateful to because of that. Those illustrations you made, the straightforward site menu, the friendships your site make it easier to create – it’s got many terrific, and it is facilitating our son and us imagine that the issue is thrilling, and that is truly mandatory. Thank you for everything!